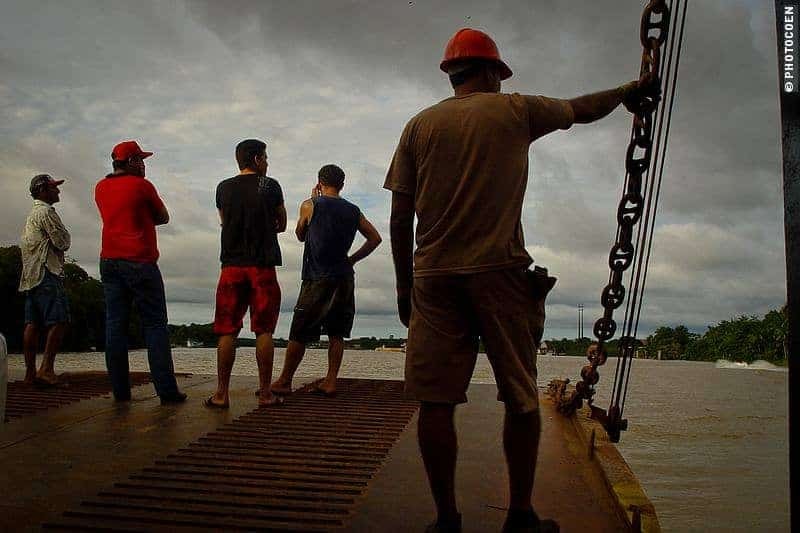 When Coen returned with the good news he had found a boat that sailed from Belém to Macapá tomorrow, I was thrilled. 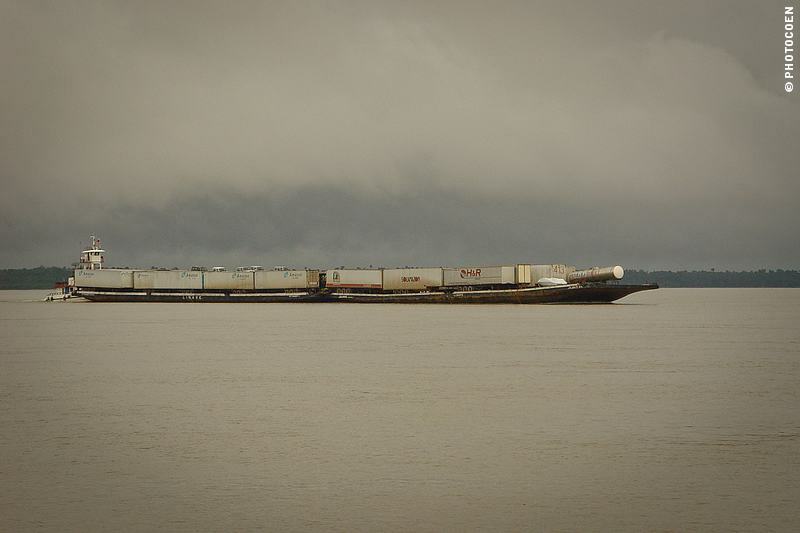 Most cargo boats sail only on weekdays and today is Friday. That would mean we would have to spend the weekend in Belèm, a city that at first sight didn’t appeal to us and which we don’t feel like exploring at all. So, if we can cross the Amazon tomorrow, that would be fantastic. But not as a stowaway. 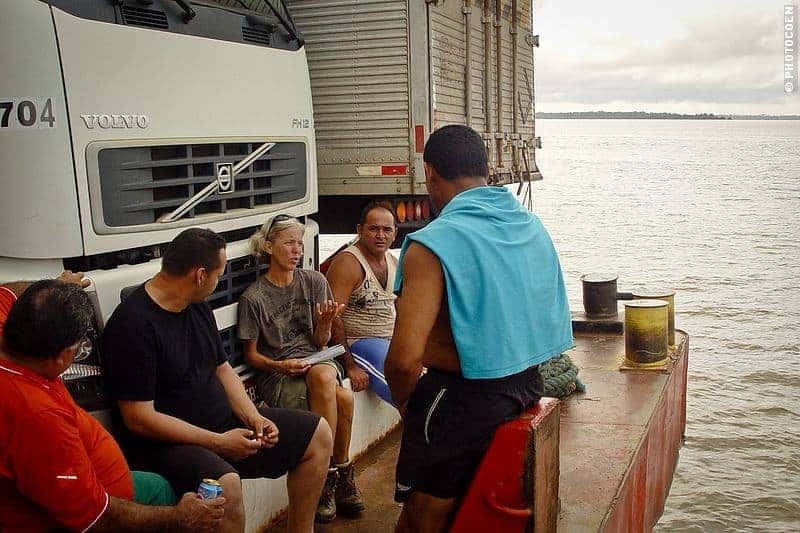 It is not an option that Coen will be the stowaway and I the driver – that would mean that I’d have to drive the Land Cruiser onto the ferry and park it accurately within the millimeter among those enormous trucks with not a centimeter to spare. It is not a serious option and we both know it. So back Coen goes, to shipping company number 1. 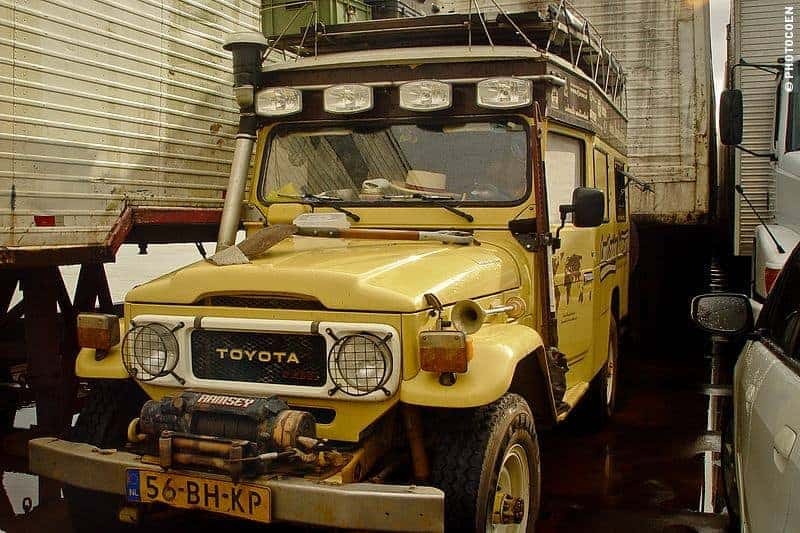 With a better price from the competition he bargains harder and half an hour later he returns to the Land Cruiser. We take off like a shot to buy some groceries and return in no time. We can’t wait to go! The loading, however, takes much longer than planned. Instead of eight it is eleven o‘clock by the time Coen drives onto the cargo boat. We don’t mind. It’s been a lucky break to have been boarding at night actually, when temperatures are acceptable and waiting in the open-air, unshaded parking lot was doable. We are in the tropics, close to the equator. The days are sultry and come with rainstorms that turn the surroundings into a sauna. By the time the boat departs we are asleep. The first stretch is pretty rough, which wakes us up. A sheet of metal has not been properly fastened and clangs against another piece of metal throughout the night. Later we see that the truck next to us has not been properly secured and thus moves back and forth, making the banging and creaking noise. 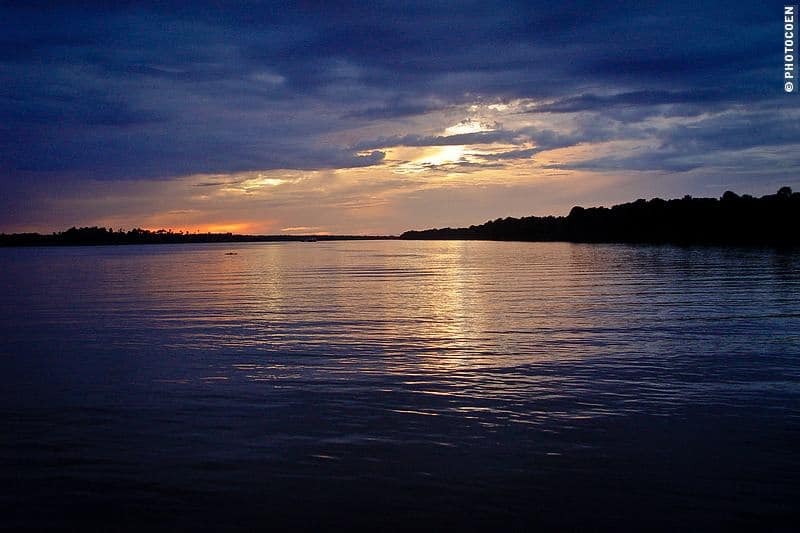 After we have sailed for about twelve hours we reach the confluence of the Amazon and the Tocantins Rivers. 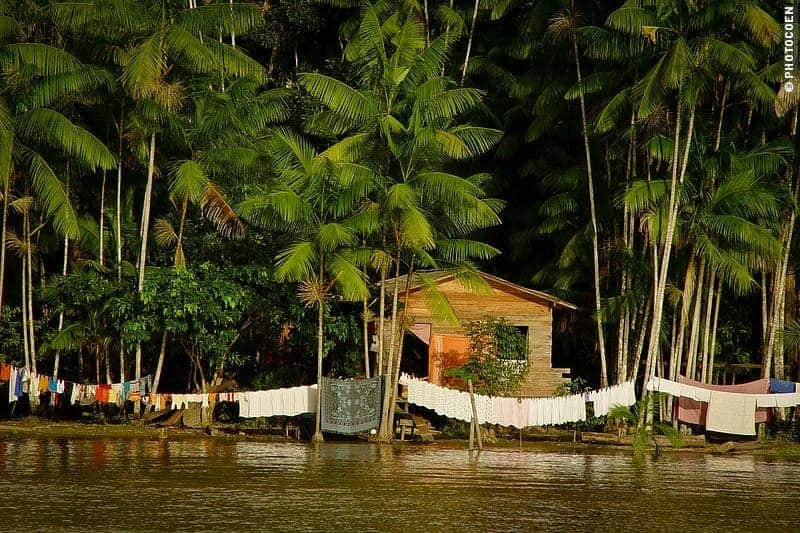 We sail westwards, underneath the island of Maracajó, which is the size of Switzerland. 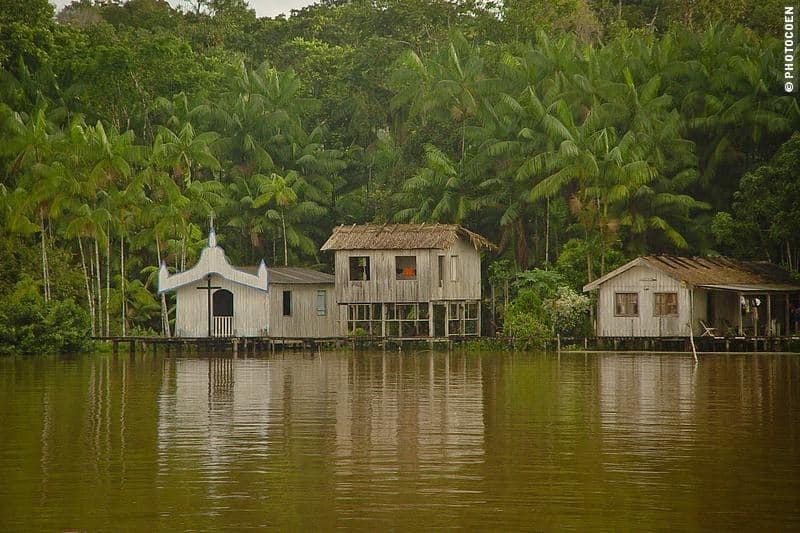 As we weave our way through the waterways we pass endless, impenetrable rainforests. Close to the shore we can hear the birds and sometimes monkeys. Large parts are uninhabited, others have clusters of wooden houses on stilts that are connected with walkways, also on stilts, and an often not-too-stable-looking jetty. Some shores have bays with white beaches. The people live on fish and açaí – fruit of the (palm-like) açaí tree which has tons of vitamins and iron. Some make their living as loggers; various villages have professional mills to cut the trees into thousands of planks that will be transported to large ports such as Belèm. Life on the waterfront looks idyllic, whether it really is we can’t say, of course. The only outlandish object is a public Oi telephone on a walkway on stilts which (we assume) works due to a huge satellite dish placed next to it. This trip reminds me of the Sundarabans in Bangladesh, where we took a boat trip on a passenger boat that functions as a local water taxi among the hundreds of islands that are part of the Sundaraban delta. There we saw many sailing boats, here locals paddle canoes or pilot open boats with an outboard motor. We are now on a balsa (cargo boat) and not a barco (passenger’s boat) and thus won’t stop at the villages. We can only get a glimpse of life on the waterfront from a distance. 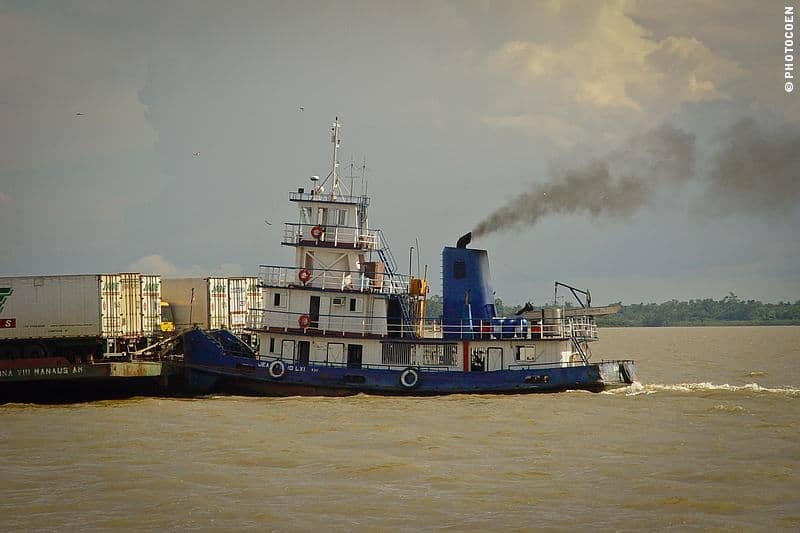 The two balsas we sail on have been made fast and are pushed by a pusher tug. When we wake up, the world is one grey mass of pouring rain. The Land Cruiser is squeezed in like a small box of matches among a collection of coffins, which gives a claustrophobic feel. Despite the rain I take my umbrella to get some fresh air. 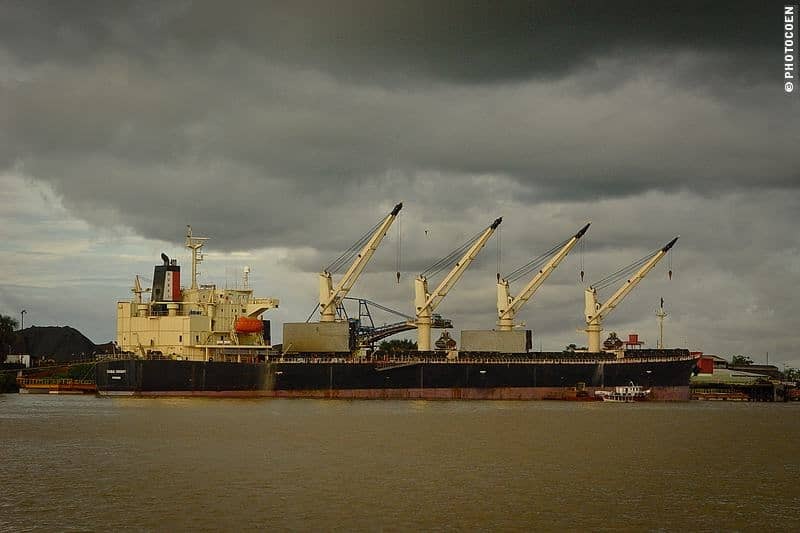 At eight the weather clears and Coen goes out to get coffee in the galley, from where all meals during the crossing are served as well – the ubiquitous Brazilian rice, beans, manioc and a piece of meat. Some of the drivers do their own cooking. 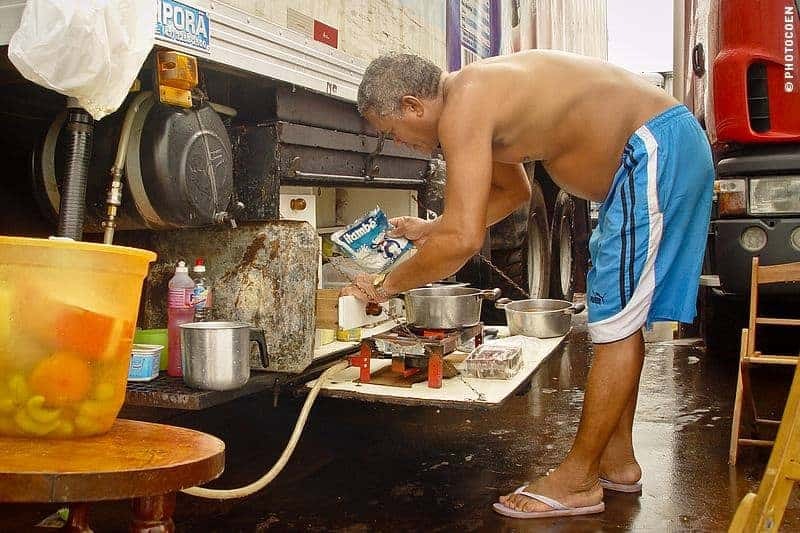 They have special cooking units and water dispensers have been attached underneath their trucks. Some appear to be cooking and eating – and drinking beer – all day long. Just as the Land Cruiser is our home, so these trucks are theirs. Several have suspended their hammocks underneath their trucks and sleep there, although some claim it’s too cold at night! I take a look up front. I get out and step in a deep puddle. 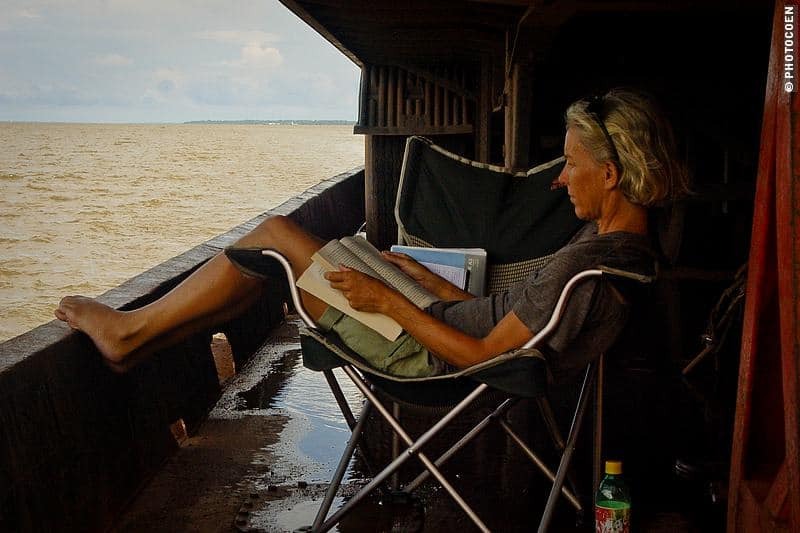 The Land Cruiser has the worst place in terms of water – the puddles stay here all weekend – but it’s better than being parked next to the truck that transports cows, which at times pee through the bars of the trailer. I am the only woman on board. At the front sit several drivers and I meet Francisco and Pedro. Francisco is 36 years old and has 8 children (the oldest being 19). He studies in Belèm to become an engineer and uses his holidays to earn extra money as a truck driver. We share stories about our cultures, our food and they tell stories about domestic violence and drunk driving in Brazil. According to them prostitution is legal in Brazil, but women trafficking is not. 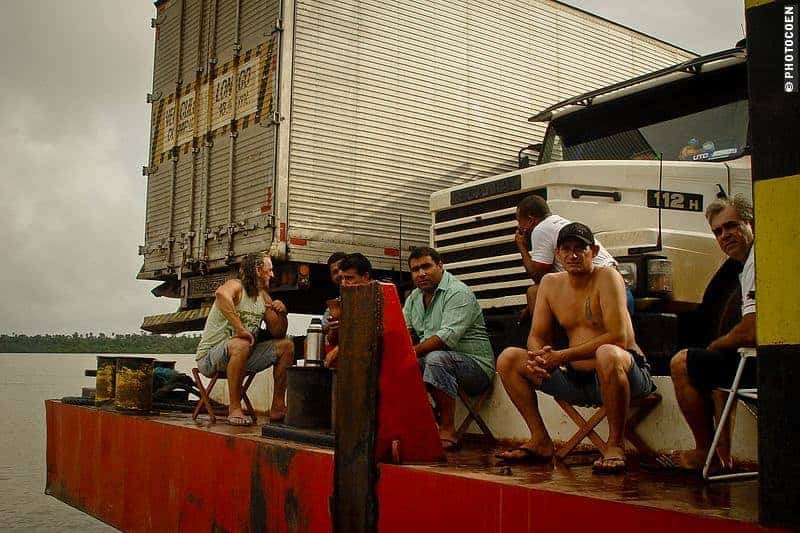 I don’t know if this is really the case but we often see many women along the Brazilian roads waiting for a (truck) driver to pick them up and I am happy to hear they don’t get into trouble for that with the police. Evening falls. Because of low clouds we don’t see the sun slip below the horizon, but through openings in the cloud cover we admire the colors changing from red and orange into purple hues before the water turns ink-black. We sit with a group of drivers on the forward deck. Some are eating, others are watching the sunset. The temperature drops to a pleasant level. Three pirogues with paddling indigenous children approach the boat, their voices echoing over the water. One of the drivers throws them two rolls of biscuits, according to him a ritual during their trips here. 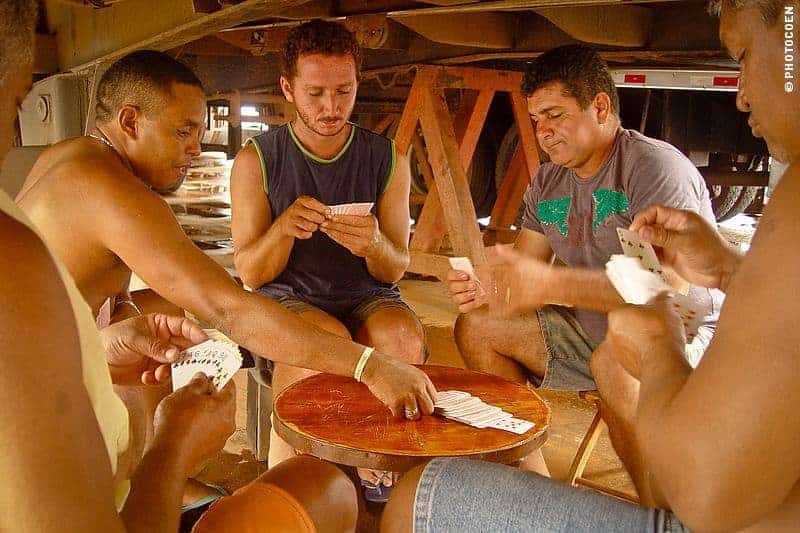 There are no mosquitoes and there is no disturbing, ear-deafening music that is so common in Brazil. Nothing but a lovely breeze and tranquillity.